71. Bow- Front Hanson Cab. A splendid looking taxi! 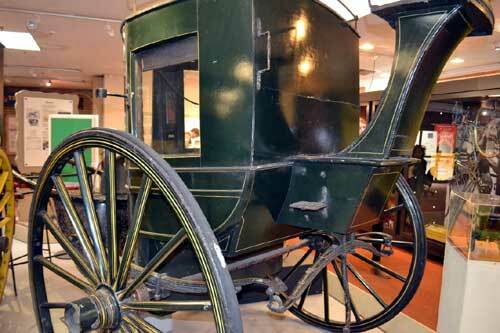 The Hanson Cab first appeared in 1834. It had large wheels to give it stability and a seat for the driver on top at the back. A roof hatch opened so that customers could give instructions to the cabbie. This Hanson was built by A.Hawkes and son of Huddersfield. Transport Gallery. Tolson Museum. This stone marked the boundary between Fixby and Fartown. It is dated 1764. This boundary stone comes from Cowcliffe. 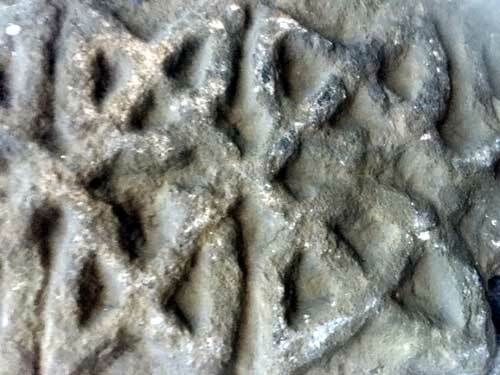 Boundary Stones such as this can still be seen in situ on roadsides. 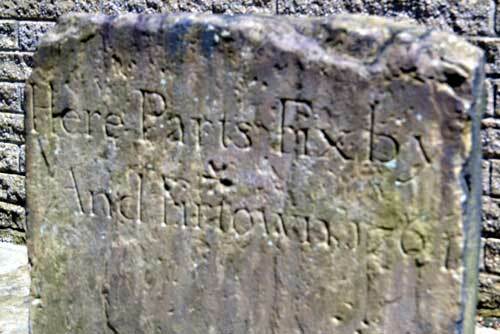 A boundary stone was often the cause of dispute. The responsibility for the repair of a road would begin and end at a boundary. The exact position of this boundary determined who paid the repair of the road. To the rear of Tolson Museum. Berry Brow Station, on the beautiful Huddersfield to Penistone Line, was opened in 1850 and closed in 1966. An extended line reopened in 1989 now going via Barnsley and on to Sheffield. 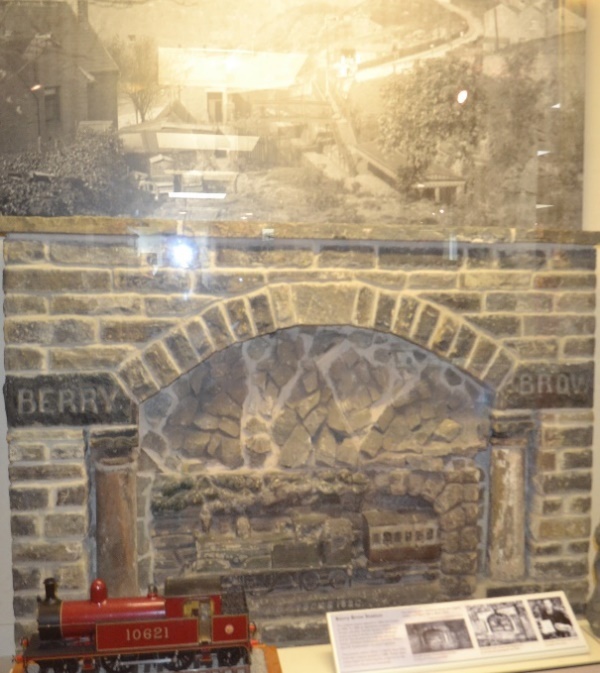 This stone sculpture was at the original station. It shows an 0-4-4T locomotive and originally had the heads of William Shakespeare, John Milton and the local railway inspector Mr Swithinbank adorning it. It was carved by John Charles Stocks, a 16 year old apprentice sculptor. Transport Gallery, Tolson Museum. 74. Roman Coins, an amazing find. A massive hoard of coins, mostly Roman were found in a pot at Lightcliffe in 1827. Over 200 were Roman, some with the head of Emperor Augustus and some with that of Emperor Caligula. 18 were of the Coritani tribe and one was of the Coritsolites of Brittany. This collection of coins were thought to be the ‘treasure chest’ of a local group of the Brigantian Clan. 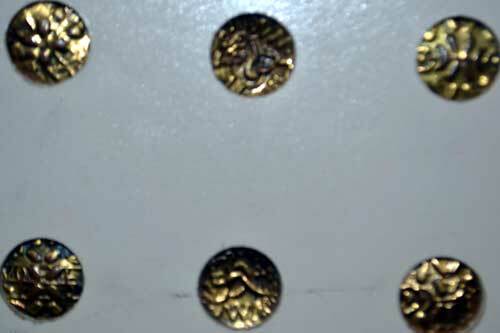 Replica coins in Tolson Museum. 75. 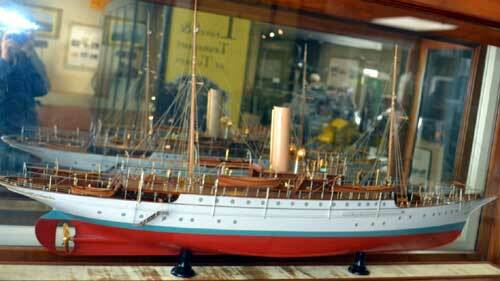 A model of the Venetia. 1904 – 1968 A boat with a fascinating career! The Venetia was built in Leith in Scotland for F.W.Sykes of Huddersfield. She was then bought by an American industrialist J D Speckles but in 1917 acquired by the American Navy. She was armed and worked in the Mediterranean and the Atlantic escorting convoys of ships. She was awarded a star for her funnel for her anti- submarine work. After the war she was returned to her owner. She was sold on after his death and disappeared from Lloyds Register of Yachts in 1968. This model in Transport Gallery, Tolson Museum. 76. Purse with Huddersfield Coat of Arms. 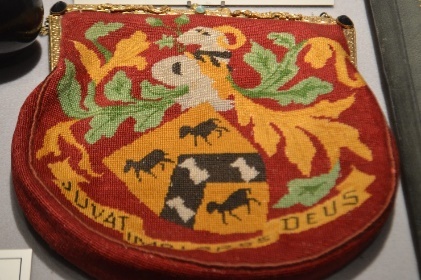 This purse was presented to Alderman Mary E Sykes when she became the first woman Mayor of Huddersfield in 1945. Mary Sykes, born in 1896, was a phenomenal lady being one of the first four women in the country to qualify as a solicitor. She had her own law firm and practiced in Huddersfield until well into her 70’s. She found time to get involved in local politics and in 1935 she was the first woman to be elected to Huddersfield Council and subsequently the first woman Alderman. On being elected she said ‘I hope to be able to do something for the women and children of the town’ She also encourage more women to take part in local politics and get elected onto the Council. Tolson Museum. The 1914 – 15 Star Medal was awarded to Harnam Singh a private in the 47th Sikh Regiment. He came from Lahore and was killed in 1915 at Ypres. He has no known grave. He is one of the thousands of men and women from Commonwealth countries throughout the world who fought alongside British soldiers. The Sikh regiments were known to be unsurpassed in bravery and courage in battle. 78. 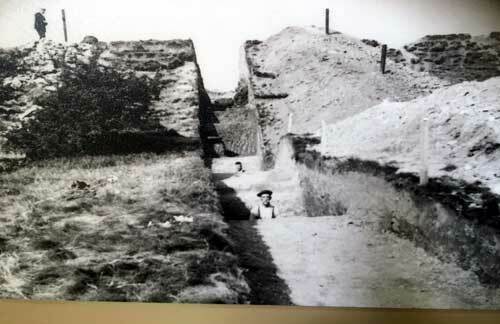 A photograph of excavations at Castle Hill. Dr Varley carried out several excavations between 1939 and 1973. Although only a small proportion of the hill was explored, his work gained a new insight into the history of the activities on the hill. From his findings, he realised that the hillfort was built and then abandoned centuries before the Roman occupation of Britain. Further excavations have been carried out on the hill by Huddersfield Archaeology Society this year (2017). Photograph of Dr Varley’s dig in Tolson Museum. The shuttle,is a key item in the production of fabric, a woven material. Made of wood, in the shuttle is a bobbin of weft yarn. At the loom the shuttle flies to and fro across the width of the warp threads, the weaver raising the alternate threads of the warp. This produces a ‘piece’ , that is a length of cloth which could range from 6 to 60 metres. Tolson Museum.